It’s time to face the reality of unsown seeds and unplanted vegetable beds. There… done. For the past few years I’ve been making a real effort tot get all kinds of annual seed growing, all kinds of cuttings started, and all kinds of summer bulbs planted, but this year something is off. Maybe I’ve been too busy with other things, but in all honesty I live a fairly lazy life and for me to say I don’t have the time or energy to start a few salvia seed or pot up a few coleus cuttings is just a bunch of excuses. My reality this year is I just don’t care to. I’m not a farmer after all, and the family won’t go hungry or broke if the potatoes fail, so I just keep enjoying what I’m doing and don’t stress it if this year I only start 10 or 20 coleus cuttings rather than 75. The iris are in bloom after all, and this year they are nearly perfect. 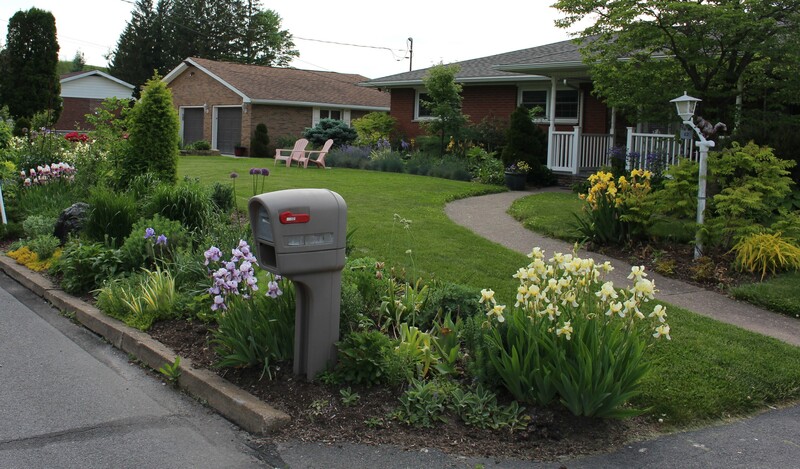 The view from the street is far nicer this spring with green grass and healthy spring growth. I forgot what it’s like to start the year with cool temperatures and ample rainfall rather than dry winds and drought. I have a weakness for iris, and go back and forth between indifference and obsession depending on the season. This year it’s obsession. 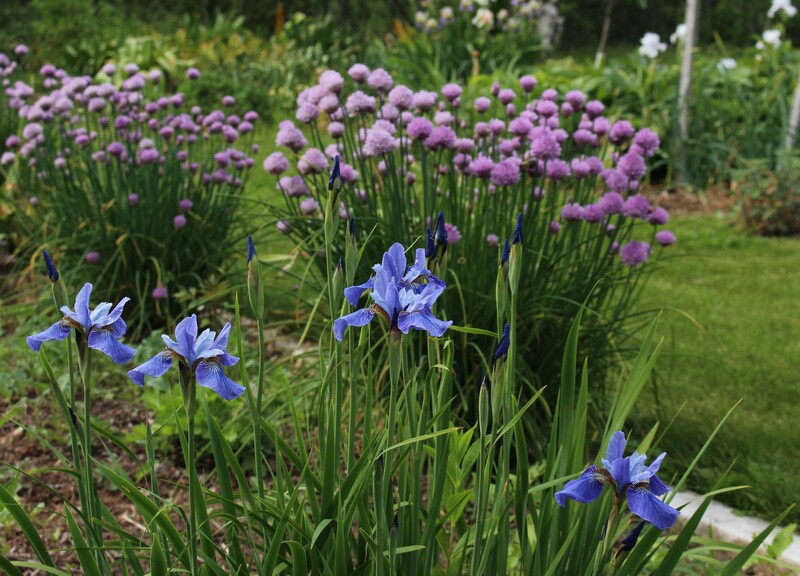 Clumps of iris are scattered throughout the front border. 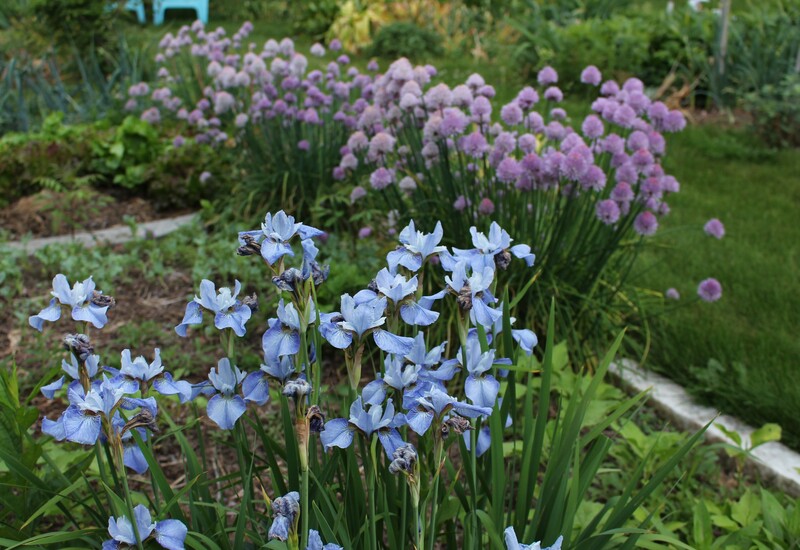 They are mostly old cultivars (~100 years) and although they lack the ruffles and fluff of the modern iris, they’re very well suited to the rough and tumble of often neglected and often overgrown perennial beds. 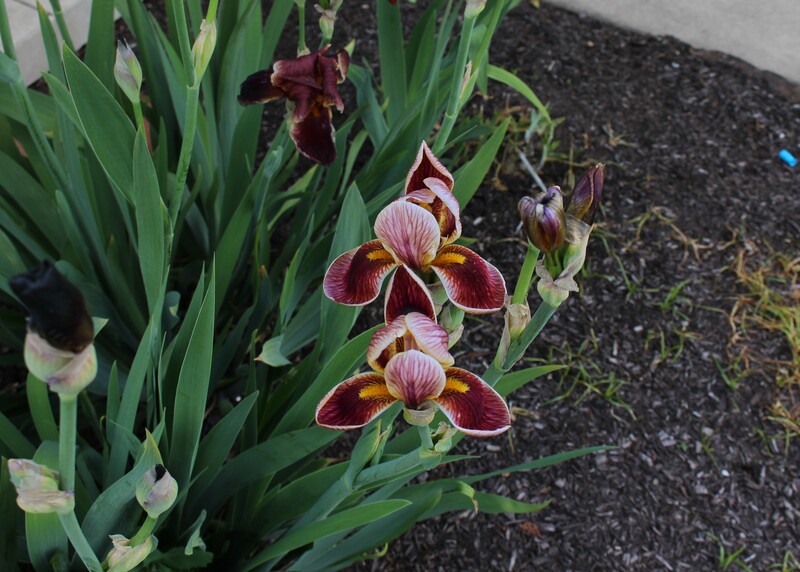 The number of blooms, the colors, the fragrance, are conspire against me this season and I’ve been on and off iris websites far more than I should admit…. even though the majority of my iris are either pass-alongs or just plain found alongside the road and had nothing to do with a catalog order. From left to right, Flavescens (pre 1813), Ambassadeur (1920), and Indian Chief (1929). The jury is still out on any big iris orders since I should really take better care of what I have, but people say it doesn’t hurt to look and so far that’s all I’ve been doing. The striped leaves of Iris pallida ‘aureo-variegata’ accenting the front foundation plantings. You can count on this iris to scent the whole corner of a bed with that delicious grape scent which many of the older varieties put out. It hasn’t been all sloth and idleness in the garden this spring. A few small projects are getting done in spite of my laziness, although I’m not promising they’ve all been done to the best of my ability or that they are the best value for my little effort. One interesting discovery I came across is that bearded iris are fairly resistant to Roundup type (glyphosphate) herbicides. That of course leads me to carelessness when spraying around the clumps next door, since the chances of iris damage are far outweighed by my ‘want to do as little free labor as possible especially when it includes pulling weeds out of monotonously boring mulch beds in someone else’s yard’. Iris foliage is fairly resistant to Roundup yet the flowers will discolor and stunt depending on how much of the poison they absorb. These flowers should be larger and a dark velvety red rather than small and anemic looking. Before anyone gets too excited, I just want to say I really don’t use too many chemicals in the garden and although I like to appear as if I’m lazily spraying about I really am somewhat cautious, if only because I have too many more sensitive plants which I’d hate to lose. For what it’s worth my research shows that iris, vinca, and nut grass are pretty much the only plants which will not be outright killed by careless Roundup spraying…. although for the vinca and nut grass the spraying was very intentional. Normal iris bloom to the left, increasing Roundup effects on the same plant to the right. A heavy dose will give a colorless cauliflower-like stalk which is entirely uninteresting. 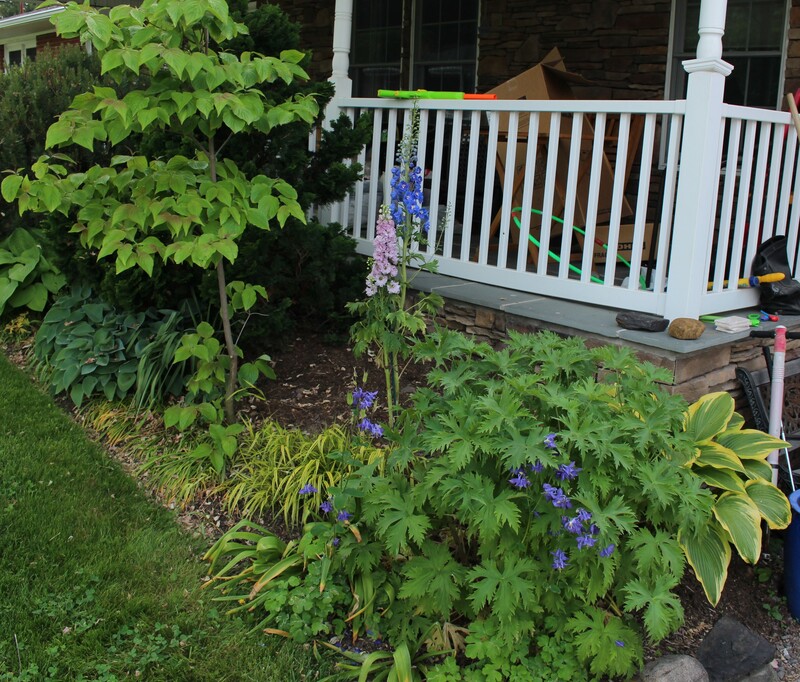 Besides chemical warfare on weeds, another questionable project started with my purchase of a Charlie Brown delphinium which needed a perfect spot in order to wow everyone with its amazing comeback. My single successful clump grows alongside the front porch so this was the most obvious spot to try another, except for the six foot Alberta spruce which already grows there. 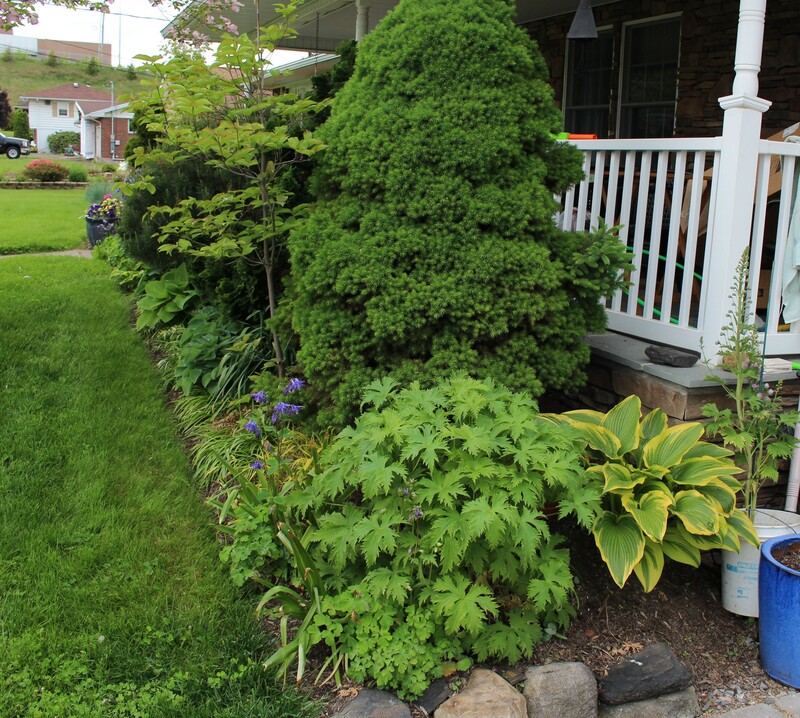 The healthy delphinium clump is front and center with the spruce behind. The Charlie Brown delphinium sits soaking in the white bucket to the right. Alberta spruce is a 365 days a year respectable plant, with an attractive form and many years of service in and many years of service to come. It would make no sense to pull it out in favor of a temperamental diva which needs fussing and fertilizing and timely staking to protect it from the high winds which strike each year (always two or three days into peak bloom season). Spruce gone, delphinium in (one of the ‘New Millenium’ hybrids). Not the most logical decision I’ve ever made but in the garden I prefer to live guilt free and impulse happy. Also, if you could, please ignore all the trash and clutter on the porch beyond. I only got around to cleaning it up after this photo was taken. I’m distracted again, let me finish up iris season. The Siberian iris and Japanese iris might be some of the most beautiful flowers of the plant world, but I don’t grow many. They seem to flower for a total of one week and although the grassy foliage looks respectable all summer and they handle nearly any abuse which comes their way I try to limit any collecting urges. 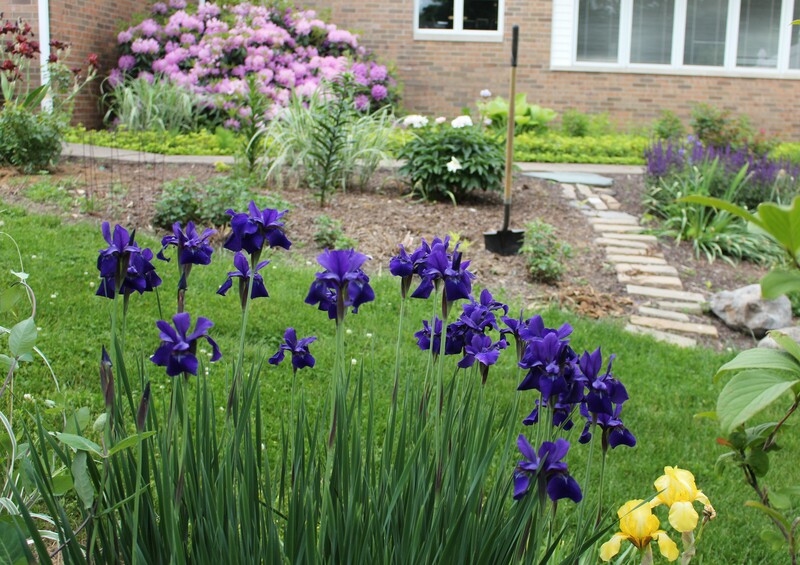 An unknown purple siberian iris with a still unplanted tropical border behind it. One Siberian iris which I couldn’t walk away from was ‘Super Ego’. It’s not because it was in bloom when I saw it or that the color was unique or any other particular quality, it was because of a childhood dream which was set on fire by a random White Flower Farm catalog which showed up in my mailbox one winter. I think I’ve confessed to being a little odd as a child so the fact that I’d sit around spending hours reading through this catalog probably shouldn’t surprise anyone, but this 1980’s era catalog (which I probably still have somewhere in the basement) had ‘Super Ego’s glamor shot in it alongside a poetic description which convinced me that owning this plant would make me richer, smarter, and more popular. Unfortunately the WWF catalog was way beyond my 10th grade budget so the actual plant never left Connecticut and I was forced to go on without. Siberian iris ‘Super Ego’ just starting to open on a Thursday. The actual experience of growing ‘Super Ego’, while pleasant enough, didn’t quite live up to my expectations. For what it’s worth, I guess I’m as smart, rich, and popular as I’m ever going to be. ‘Super Ego’ five days later after a few 90F days bleached most of the darker blue color out. The chives in the back seem unfazed by the weather or passing time, although they are entirely less exotic in my opinion. So as I wait for a new plant to come along and change my life I’ll continue weeding through the backyard iris beds. They are infinitely less photogenic with their hefty companion plantings of weeds, but the old iris continue to carry on and deserve more respect than their neglected planting spot gives. I even planted a few zinnia and marigold seeds last weekend. That may not speak of high class and taste nor earn me a spot in the White Flower Farms catalog but it does mean that things are starting to move on the seed front, and if it all works out July and August should still be full of flowery color. 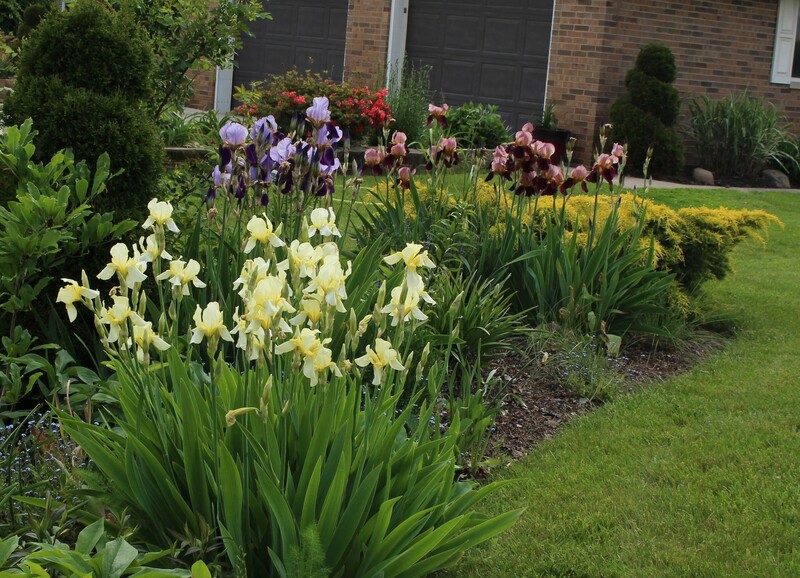 This entry was posted in garden stories, iris, late spring, perennials, Uncategorized and tagged flowers, garden, heirloom flowers, iris, spring. It’s not a small thing to take out a spruce of that size. Did you dig it out or wrap a chain around it and pull it out with a pickup truck? Looks like the sapling next to it will have more room now. I don’t believe for a minute you took it out *just* for the delphinium. 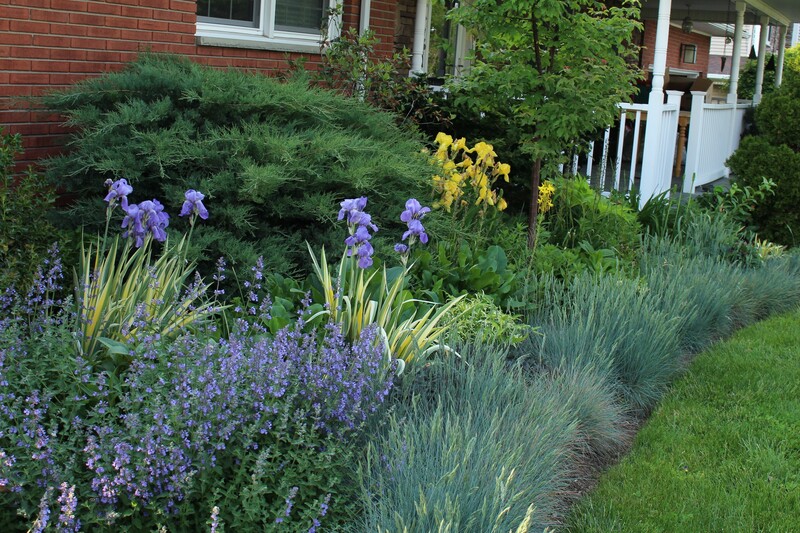 Your front roadside border is looking might nice and I agree about the heirloom iris being able to take more abuse. I think I might put a few bulbs in as well, it’s such an empty spot right now and I don’t think I have the patience to wait for the delphinium to grow in…. if it ever does! The iris do handle abuse well. In another few weeks they’ll be mostly covered by other plants and as long as I pull a couple out to keep them from getting too crowded they do just fine. Heirloom plants are indeed wonderful. Your front garden is a marvel. Thanks for sharing that view. Thank you John, that’s very nice of you to say! You sound very laid back – a good way to be rather than stressing too much. Your Irises are beautiful, irises always are! I bounce back and forth between being laid back and then stressing out about having been too laid back… but then force myself to relax. In reality I’m a mess but at least the iris still do fine! I know you’ve identified them in another post, but would you mind reminding me of the name of the grass you’ve used as edging in the fourth picture? I’d really appreciate knowing. The grass is blue fescue (Festuca glauca) but I don’t know the exact cultivar since I stole it out of my brother in law’s yard 🙂 It’s really exploded this year with all the rain so normally I don’t see so many seed heads forming, usually it’s a neat border of well behaved, grassy clumps. The other day I was informed it looked overgrown and I’m not sure how I’m going to handle the shagginess. It’s not the look I’m so worried about it’s the prospect of it seeding itself all around the border and lawn. Your irises are great, especially like that strong purple one. Thanks! The darker colors always look so rich. What a superb collection of irises! As for not doing all you would like to do in the garden, join the club. I thought once I was retired I would be able to do all I wanted in the garden but that was an illusion! Uh oh. You’ve just crushed my dream of having all the time I needed some day… but nice to know at least I’ll be in good company! We were ahead of our times. Today we could have joined a ‘children who garden’ Facebook group and would have all been unusual together! Even with a disaster of a vegetable garden I find the space doesn’t stay open long. -and that’s part of the problem, I’ll have dahlias everywhere in a few more weeks, and no room at all for a fall crop of beans or arugula! Oh but what dahlias you’ll have – I’ll look forward to them! 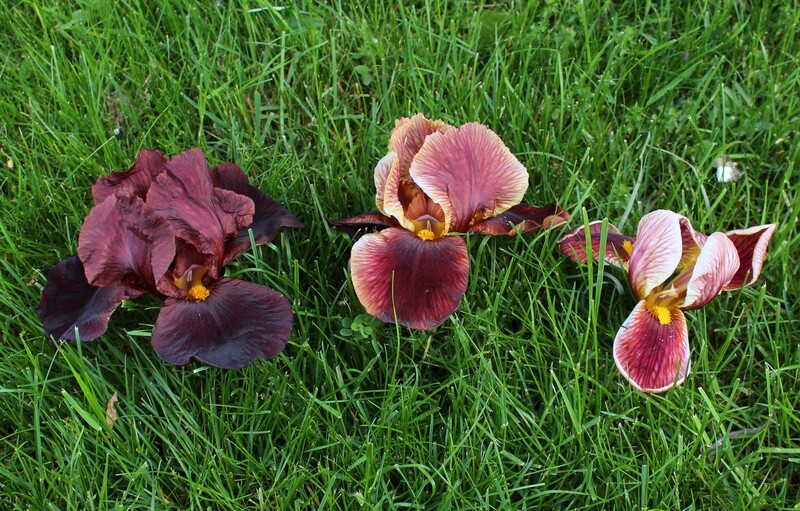 Your irises are wonderful – I especially like the dark purple Siberian one and the yellow Flavescens. Some of mine are about to open, but they are rather pathetic compared to your lovely big clumps. Flavescens is such a reliable iris, I’m so glad I found it! My garden is nearly all dry, exposed and sunny and the iris have no problems making huge clumps. It’s all the other plants which tend to look pathetic, so I do like to bask in the joy of iris season! I like all of your irises, but the yellow ones in particular. I am way behind in my gardening tasks, also–what with graduation followed by a week at the beach, followed immediately by a big graduation party, and then getting the daughter ready for a 12 day trip to Ireland and England, etc. . . leaves precious little time for what I really want to be doing! I just keep reminding myself that it’s all better than last year, though! It is all better than last year, and I’m glad your health has improved so much… but you’re right, there just aren’t enough hours and energy in these days and sometimes grubbing weeds out of the dirt isn’t the most fun. You have a beautiful selection of iris, Frank. The garden looks great too. Most of my iris are done for the season, but some still remain. The heat was brutal for a bit, then the temps dropped which saved the remaining iris. I like your RoundUp test. I have been believing the strengh has been reduced. I used it on Poison Ivy and it took many applications before it finally set it back. I’m enjoying this break from the heat and got a lot done in the garden this weekend. Now if only a little rain would come our way it would be perfect -but I think this is going to be a cool, dry summer. We will see. I think for poison ivy you need a specific brush killer. It might just be the regular roundup but more concentrated, but then I also read today that it’s a different formulation for woody weeds… not sure how much of that I believe though. Very often, it’s simply okay to enjoy the beauty that you have. I’ve often found that when something feels like a chore, it becomes less enjoyable. 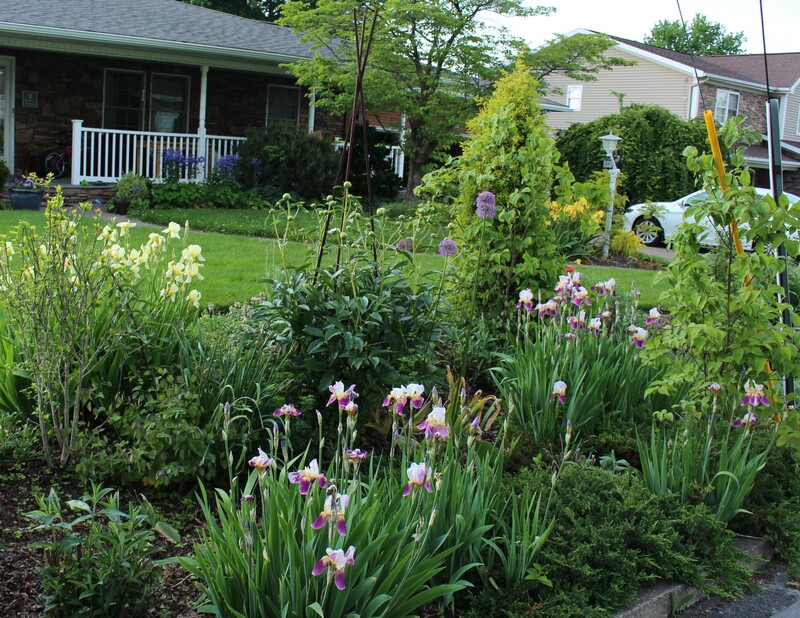 So, enjoy your garden — it’s lovely. I do my best to avoid chores, but sometimes it just has to be done. Over the last week two people said the garden looked “messy”. I’m trying to remedy that this week! I have a sneaking suspicion deer have been strolling through the yard, I’ve seen a few nipped phlox and I’m not at all happy. More iris might be a very good thing. I am very impressed with your iris collection, they are gorgeous. It is funny how our obsessions change as the year goes on. Snowdrops? Poo, what was that all about? We must have been mad. Irises are all I think about now. Along with roses and peonies. It is very true that we get strong winds just as the delphiniums are about to bloom, at the very moment that we remember that we haven’ t staked them. That’ s my experience anyway. I was just thinking this weekend how finally for once I’m not obsessing about snowdrops. I bet if someone threw an order sheet in my hand today and forced me to buy something I’d almost be able to look cool and collected and only buy a handful of essentials.